Conservatives are guilty of murder, theft, and other miseries -- all in the name of greed -- but their duplicity in the matter of climate change is quite different, it's a business model that will lead us to genocide in the name of greed and short term profits. And Kate Sheppard's article a few years ago at Motherjones.com, "Inside Koch's Climate Denial Machine," tells us just how the Koch brothers finance the End of The World. "Who’s behind a multi-million dollar campaign to seed doubt about climate change? It’s not just Exxon and Chevron—it’s also Koch Industries, an oil and gas giant that most people have never heard of, according to a new report from Greenpeace. 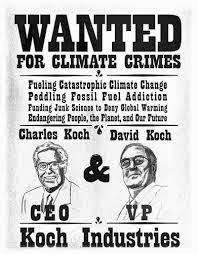 Koch's extensive funding of anti-climate work makes it the 'financial kingpin of climate science denial and clean energy opposition,' says Greenpeace. "The Kansas-based company and its affiliates and foundations spent almost $25 million on 'organizations of the "climate denial machine"' between 2005 and 2008, according to the report. 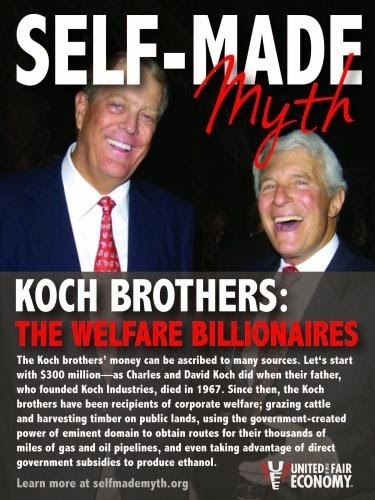 Koch Industries and the Koch family also spent $37.9 million between 2006 and 2009. 'Although Koch intentionally stays out of the public eye, it is now playing a quiet but dominant role in a high-profile national policy debate on global warming,' the report concludes. "The company is led by brothers Charles G. Koch and David H. Koch, and is the second largest privately-held company in America. As I've reported previously, their estranged brother, William, is behind the efforts to block the Cape Wind offshore wind project in Massachusetts. Koch money comes through a lot of business interests – ranching, mining, oil refining, and producing paper products, fertilizer, and chemicals. 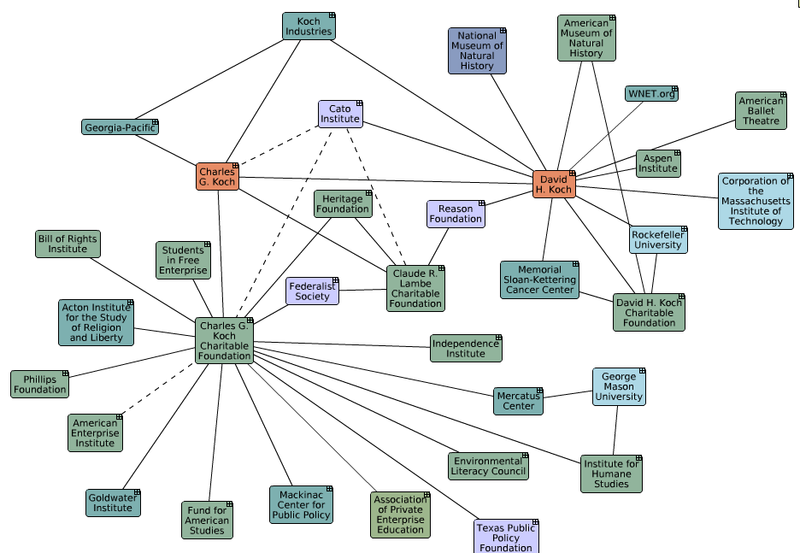 "The report lists 35 organizations who have directly or indirectly received money from Koch Industries, affiliates, or Koch family foundations. They include the libertarian think-tank Cato Institute, which received a $1 million grant from the Kochs. Cato runs the climate-change-denial site GlobalWarming.org, and is suing the Environmental Protection Agency to block its finding that climate change threatens human health. The Koch family has also directed more than $5 million to Americans for Prosperity, which has campaigned against efforts to cut greenhouse gas emissions. They have also supported Citizens for a Sound Economy (which later merged with another group to form FreedomWorks). 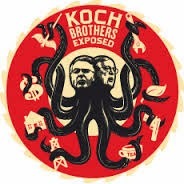 "The Koch PAC has given more than $10,000 to 21 lawmakers since 2004—four Democrats and 17 Republicans—which is more than any other oil-and-gas sector PAC, the report states. Topping the House recipients: Henry Cuellar (D-Texas) at $30,500, Eric Cantor (R-Va.) at $28,000, and Joe Barton (R-Texas) at $26,500. On the Senate side, Jim DeMint (R-SC) and Lisa Murkowsi (R-Alaska) both received $20,000 in Koch Funds, and Blanche Lincoln (D-Ark.) received $18,000. "Between the foundation-funded groups, lobbying, political action contributions, Koch Industries and the Koch brothers are "among the most formidable obstacles to advancing clean energy and climate policy in the U.S.," Greenpeace states. 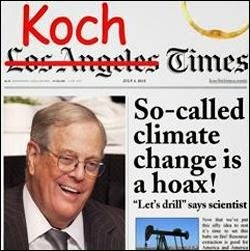 "The report also looks at Koch's role in the so-called 'ClimateGate' scandal, in which emails between scientists were hacked and made public. There’s been little doubt that this and other recent attacks on climate science were a coordinated attack (See second article, below -- Joyce, Jnr.) by well-organized and well-funded groups hoping to sow doubt about the validity of climate change. Greenpeace notes that 'Twenty organizations, roughly half of the Koch-funded groups profiled in this report, have contributed to the "ClimateGate" echo chamber."' The groups have posted articles, hosted events, and landed their in-house skeptics on cable news. Cato, for example, recently boasted that its senior fellow, Pat Michaels, was 'at the center of the "ClimateGate" controversy' in their newsletter. 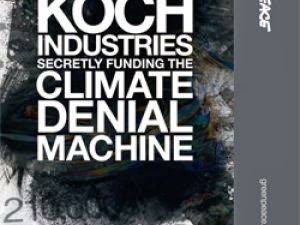 "Check out the whole report, an excellent case study of the climate denial machine. (Also, I should note, you may see ads for the report on our website this week)." "The back story: last November someone hacked into computers at the Climatic Research Unit at East Anglia University and stole more than 1,000 emails between climate scientists. They then circulated select portions of those emails in an attempt to create the appearance of impropriety among the scientists and to aid the skeptics' cause. Detailed examination of the entire email dump revealed, at worst, some unprofessional behavior—but it also affirmed the vast body of scientific evidence supporting climate change. But that hasn't stopped skeptics from seizing on the so-called Climategate affair—in lawsuits against the Environmental Protection Agency to calls from Sen. Jim Inhofe (R-Okla.) for a criminal investigation into climate scientists. "The hacked emails and subsequent attacks have put climate scientists on edge. This was made clear in recent exchanges between scientists on a National Academy of Sciences listserv that an unidentified source leaked to the conservative press last week. Now, on cue, right wing, anti-climate forces are declaring outrage that scientists were discussing how to best respond to the PR disaster of Climategate. "The folks at CEI evidently think they're revealing yet another outrage—but maybe it's not the one that they think. How much more proof do we need that the assault on climate science is part of a coordinated attempt by polluters and their pals at anti-science bastions like CEI to confuse the public about global warming and malign the scientific community?" Kate Sheppard was a staff reporter in Mother Jones' Washington bureau from 2009 to 2013. She is now a senior reporter and the energy and environment editor at The Huffington Post. She can be reached by email at kate (dot) sheppard (at) huffingtonpost (dot) com and you can follow her on Twitter @kate_sheppard. Why Do People Vote For Republicans? Don't you wish you had a few billion dollars to make even more money? 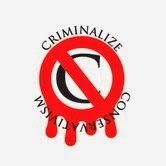 When the greediest among us lie, cheat, and steal it's no crime, and when they finance lies that will eventually result in a planet devoid of life for the sake of short-term greed, there oughta be a law. 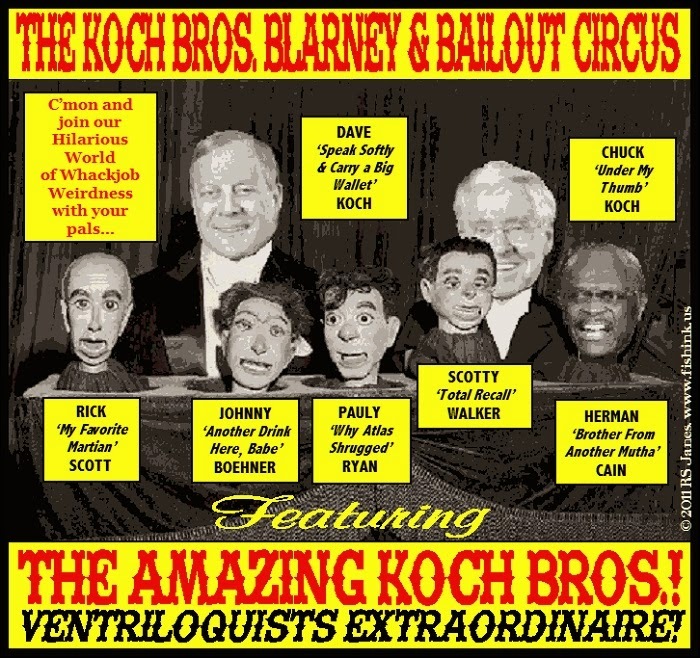 If it wasn't so tragic, the con job the Koch brothers are pulling on the Conservative Sheeplets would be a hoot. When Conservatism is outlawed and assets from criminals like the Koch brothers, we will still have to watch people like these very carefully. Conservatives have donned Democratic clothes before, they do it now, and they'll do it again. my life. What on Earth did conservatism ever accomplish for our country?" I was just coming up with some proof with regard to the Koch Bros. meddling in several political and commercial affairs that involved collusion at the highest levels, but the Democratic Underground saw fit to ban my presence from their site. But your articles and your perserverence gives me great hope that the cons will be taken out soon. Keep up the good work!